Old Boy is a rom-com about a forty something single father (Liu Ye) who finds love again after meeting a feisty high school teacher (Ariel Lin). Fingers-crossed the adults don’t act like immature teens in this drama. Lei Jiayin, who got his big break playing the ex-husband in The First Half of My Life plays Liu Ye’s best friend, and Guo Shutong (Yesterday Once More) plays the heroine’s outspoken housemate and good friend. Talented child actor Hu Xianxu, of Nirvana in Fire 2 and A Love for Separation fame, costars as Liu Ye’s rebellious son Xiao Han, who shows up on his father’s doorstep after the death of his mother. The 45 episode drama will air daily on Hunan TV beginning tonight. Filming is well underway for Oldboy, and they’ve released a new teaser and more character stills. The drama tells of the ‘sweet romance’ between a pilot and a school teacher, played by Liu Ye (All Quiet in Peking) and Ariel Lin (The Mysteries Family) respectively. Liu Ye (All Quiet in Peking) will be playing pilot Wu Zheng, the titular Old Boy 老男孩 who finally finds love at the age of 40. Also cast is Ariel Lin (The Mysteries Family) who will be playing the feisty heroine, a high school teacher who returns from overseas. Given that this is set partly in Chengdu, all I could think about was Chengdu’s famous ear cleaning services. With a view to his mating, the one and only object of his life, the Night Peacock moth is gifted with a wonderful prerogative. He is able to discover the object of his desire in spite of distance, obstacles and darkness. The go-to mainstream actor for artsy films, Liu Ye, joins Liu Yifei in the first film to be screened in China by writer and director Dai Sijie since Balzac and the Seamstress in 2002. Night Peacock 夜孔雀 tells of flute player Elsa (Liu Yifei) and her romantic escapades with first a scholar of silk (Leon Lai) and then a tattoo artist (Liu Ye). Yu Shaoqun joins the cast as the silk scholar’s Leon Lai’s son, a Sichuanese opera singer who appears to be into cross-dressing and may be in a mental asylum based on the trailer. I’m guessing that Liu Yifei is banking on this to be a career-changing film after a series of poor commercial flicks and poor acting. Hopefully she can prove herself this time. The film airs on May 20th. Photoshoot Roundup: (belated) Happy Father’s Day! After seeing trailers for this and Nirvana in Fire, I’m officially a fan of this team from Shandong TV Group, whose trailers are all film-qualitied. All Quiet in Peking 北平无战事 features a truly all-star (i.e. not just pretty, but amazing actors) of Liu Ye, Berlin Film Festival’s new best actor Fan Liao, Chen Baoguo, Wang Kai (who is also a lead in Nirvana in Fire). The drama is directed by Kong Sheng and produced by Hou Hongliang, the duo behind Nirvana in Fire and Chuang Guandong. The script is by Liu heping of Emperor Yongzheng 雍正王朝 and Ming Dynasty1566 大明王朝1566. For those of you who celebrate it, Merry Christmas! 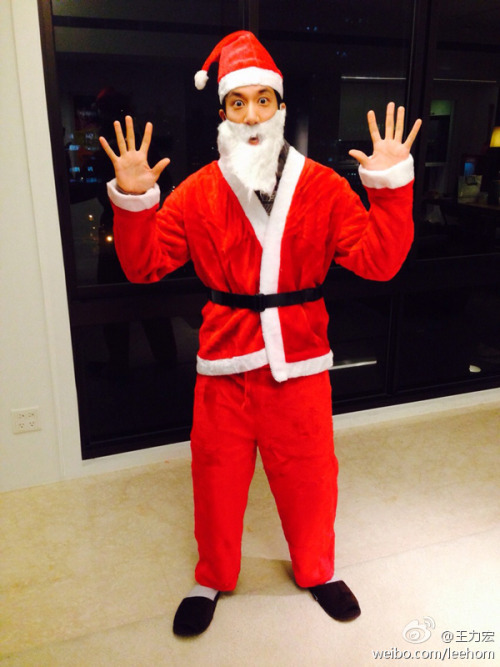 For those of you who don’t… have Wang Leehom in a Santa costume. The reindeer all went on vacation, living Santa Claus to sit on a plane to Ji’nan all by himself! Some more silliness, but also a solemn farewell, behind the cut. Saturday August 17, 2013 is International Homeless Animals’ Day. Though I don’t think there are many homeless horse running around in the big city near you, but the natural beauty of Li Fei’er is too good to pass up. To represent the disproportion of homeless felines compare other animals in the homeless shelter, this week’s photoshoot Friday has more puppies than kitties. Showing off their love for kittens are Jin Sha, Zhang Hanyun, and Wang Luodan. And on the puppy side we have Zhang Jiani, Huang Haibo, Qi Wei, and Liu Ye. Wang Likun is getting her self ready… are you?